As mentioned a fortnight ago, (https://ruthdehaas.wordpress.com/2016/01/15/guess-whos-back/) I have a resolution to read at least 50 books this year. The impetus behind this resolution is partly business and partly pleasure. As a writer, I want to see what my contemporaries are doing, and to learn more about the craft in general. As a civilian, I want to rediscover the joy of being swept into a different world. A good book is totally immersive and brain-stimulating in a way nothing else is: words on a page translated into pictures of the imagination. I’ve established some rough rules of engagement. I’m being strictly quantitative in some respects: I’m reading at least one per week, setting aside time each day to read, and setting a daily target of pages to get through. And I’m recording each book in a spreadsheet as I finish it. In some other respects, I’m being more laissez faire. Books of all types and formats count: novels, non-fiction, comic books, audio books, fan fiction. And I’m trying to be as diverse as possible in my reads, on every axis: old books and new, classics and trash, books in every genre by authors of every background. I’m encouraging friends to recommend and/or lend me books of any kind, so that I can experience the full rich variety of literature. It’s easy to get sucked into reading the same type of thing all the time, and while as a fantasy author I clearly need to keep up with the genre, I don’t always want to be reading trilogies about dragons. My to-read shelf as of today. No more glorious sight to than an array of colourful paperbacks waiting to be cracked open and devoured. Right now I’m listening to the audio book of War and Peace, and reading a paperback called Heat Stroke: Weather Warden book 2, which was a gift from a friend. One is a monument of European literature about Napoleon’s army getting inconveniently in the way of some Russian aristocrats’ love lives. The other is a book about a weather-controlling genie who wears lime-green stilettos. I started reading it, thought ‘what a load of rubbish’ and immediately read 100 pages. Each is enjoyable in its own way, and every book teaches you something – about writing, about reading, about human nature, or about the Battle of Borodino. Hello there my lovelies. After a three-month hiatus, I’m back in business! So what’s new? Well, my original plan back in October was that I would get my head down and finish my novel The Silvergreen Sea before Christmas. That, um, didn’t happen as planned. Instead I did NaNoWriMo. For the uninitiated, this is national novel writing month, an annual thing where you attempt to write a novel in November. ‘A novel’ is deemed to be 50,000 words, which is a tough-but-achievable target, and without a day job, I had no excuse not to hit it. The great thing about NaNo is that, because it’s a big event, you can go to meetings – or just hang out online – with lots of other people attempting the same thing and swap tips, make connections, and generally appreciate the fact that you’re not the only insane person out there. I’ve done it once before – back in 2011 – and decided it was time for another plunge. So I started a completely new book – working title The Tide of Fire – went to a bunch of meetings, and dutifully churned out my 50,000 words of magic, murder, and mayhem. It was good fun, and now I have the makings of another novel – about half a rough draft. But what about my current novel, the one I was supposed to have finished by Christmas? Well, to be honest with you, I’d been working on it for so long I was thoroughly sick of the thing, and I desperately needed a break. NaNo provided that while keeping the creative juices flowing. Now, refreshed, I’ve picked up The Silvergreen Sea again and started on the final edit, aiming for completion by the middle of March. All this brings me round to the two questions which must always be asked at this time of year: what’s my new year’s resolution? And did I achieve last year’s resolution? Checking back, I see that my 2015 resolution was to finish The Silvergreen Sea. Oops. Guess I dropped the ball on that one. Oh well. So, my 2016 resolution is – guess what – to finish The Silvergreen Sea. But – famous last words – that’s not going to take a whole year, and so I’m going to have a couple more resolutions. One is to finish The Tide of Fire in first draft. And another is to read at least 50 books. 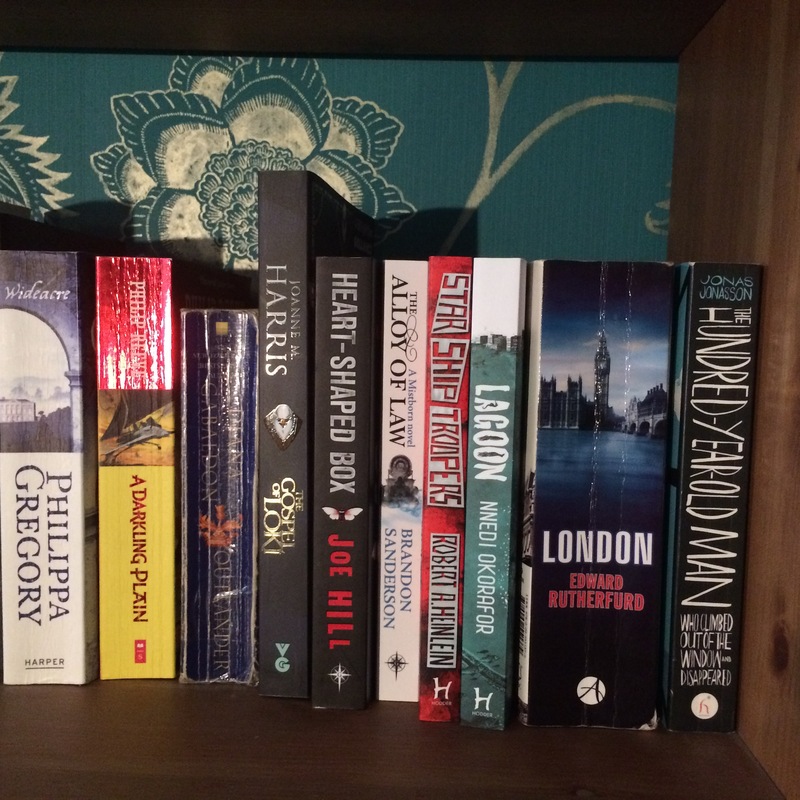 (Last year I watched an awful lot of television, so I’m thinking 2016 should be the Year of Reading). I’ve read three-and-a-half so far, so I’m off to a good start. Let’s see if I can keep up the momentum, and not leave my to-read shelf as neglected as those gym memberships. Best of luck for all your endeavours in 2016. Unless your endeavours involve annihilating the human race.